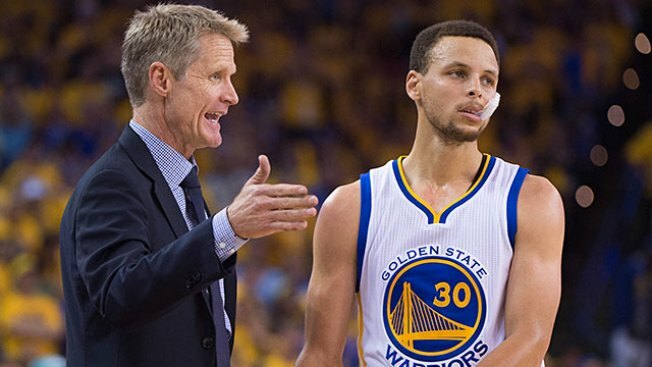 Warriors coach Steve Kerr and MVP Champ Stephen Curry. After nearly nine months reaping the benefits of unity, being of one mindset, the Warriors are, in at least one regard, splintering as they approach Game 7 of the NBA Finals. A loss would slap the term “failure” on this season, say guards Steph Curry and Klay Thompson. “Yeah, pretty much, because that was our goal from the beginning,” Curry said Saturday, on the eve of Game 7, echoing comments Thompson made two days earlier. A loss would not define the season as a failure, says coach Steve Kerr, who took mild umbrage that someone would frame such a question. “I don’t want to insult anybody,” Kerr said. “I think that’s an unfair question. And I never look at sports that way, and I think it’s insane. What we have here may be less a difference of opinion than a disparity in perspective. Kerr is 50 years old. He’s in coaching after completing a 15-year playing career, during which he won five championships with two different franchises. He’s a married father of three. He’s coping with the lingering agony of back surgeries performed last summer but have yet to heal. He also carries with him, every day since he was 18 years old, the brutal assassination of his father, Malcolm Kerr. Curry and Thompson are, by contrast, two young men in the primes of their careers with a completely different outlook on life. Curry and Thompson look at Game 7 as a referendum on them and their status in today’s NBA. Kerr looks at Game 7 as, well, Game 7 of the NBA Finals. “Reputations from the critics, and that’s all part of this machine that the NBA is, and that’s why we all make a lot of money,” Kerr said. “That’s why it doesn’t bother me. So everybody’s reputation is at stake in terms of legacy or whatever and what people write. But in terms of the people that matter – your family members, your friends, your teammates, the people in the organization – nobody’s reputation is at stake. Kerr and his players do agree on the desire to win another championship. It’s there, in full, for all.